The Honda Odyssey is a sleek, sophisticated minivan that drives more like a sedan than a van. Equipped with all the features minivan owners have come to expect, the Honda Odyssey is a fluid drive with luxury options that include a back-up camera integrated into the rear-view mirror. Shopping at AMS Vans for a customizable Honda Odyssey Vans with wheelchair van conversions for sale gives you complete accessibility and safety in a style-rich package. Declaring the Honda Odyssey their "perennial favorite" among minivans since the late 1990s, Edmunds.com lists the Odyssey as the consistent recipient of their "Consumers' Most Wanted" award since 2005. 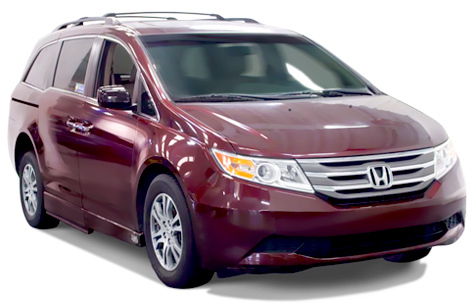 The refined design, responsive steering, smooth handling and luxury features like memory-linked side mirrors, tilt/telescoping steering wheel, and tri-zone climate control earned the Honda Odyssey the label of "most car-like minivan on the market today." This side- or rear-entry handicap van conversion comes standard with a powered ramp and several wheelchair positions. View our inventory for Honda conversions. The Honda Odyssey also features a touring model with standard features like leather interior, heated front seats, satellite radio, Bluetooth connectivity, memory driver's-seat settings, power moon roof, cool box, front and rear parking sensors, power-adjustable pedals, power sliding doors, and power lift gate. With a fuel economy rating of 17 mpg/ 25 mpg highway, the 3.5 liter V6 engine boasts a "best in class" for minivans. The Honda Odyssey earned top marks in all front- and side-impact crash tests. Its superior safety features include anti-lock brakes, electronic brake distribution, tire-pressure monitoring, vehicle-stability assist, traction control, active front head rests, front seat with side airbags, full-length side curtain airbags, and a roll-over sensor. AMS Vans stands behind all our ramp van conversions, supporting every minivan with a detailed handicap-van warranty. Find Honda wheelchair vans for sale on our used inventory page. AMS Vans is not just in the business of selling wheelchair vans to customers, we’re here to help you sell, too. AMS Vans is a leading wheelchair accessible van conversion manufacturer building safe, reliable, simple and low-maintenance accessible vehicles.